I use unique 7 string for my duo gigs with Gary Mettler. When I first started to do these duo gigs I felt I wasn’t doing much. Gary plays guitar, use guitar synth to add more cool sounds like organ, strings and horn, plays harmonica (he is one of the best blue/chromatic harp player out there) and sings. And what do I do? I just play guitar. So one thing I noticed was how to make some more low ends happening. 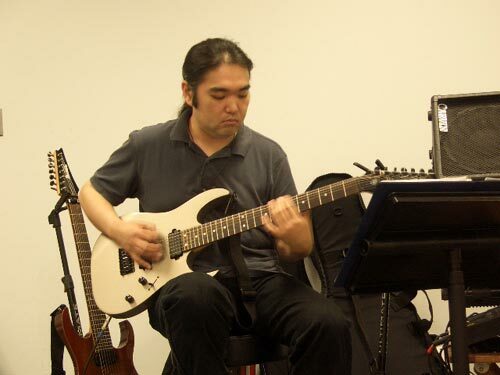 Why not use 7 string so there I started to use 7 string guitars at these gigs, I have acoustic/electric 7 I use and I got Ibanez RG2027x which got great piezo system on it, perfect for acoustic/electric gigs. Many of Gary’s songs are in the key of Am, so I dropped the low B to A to get that low end happening. Than one day I was thinking how can I go lower. 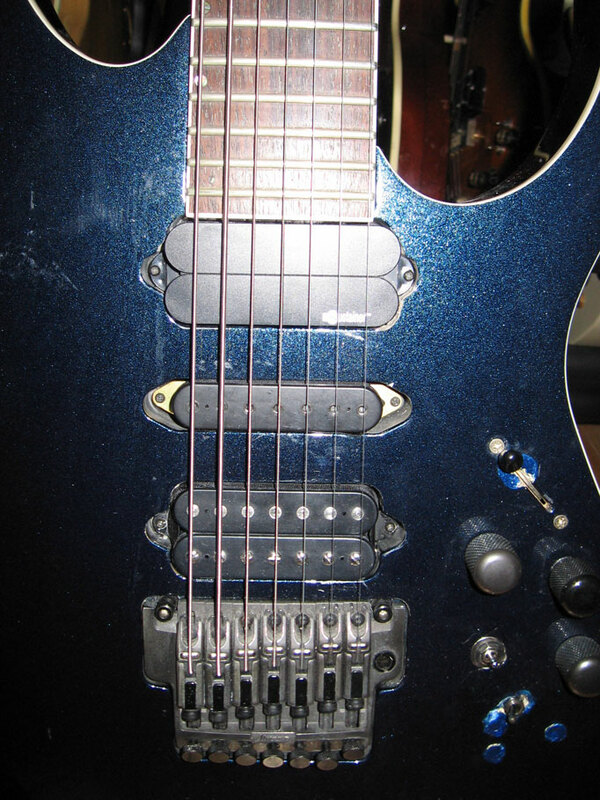 So I took the thickest guitar string available at that time which was .74 and put it on E string but tuned octave lower. 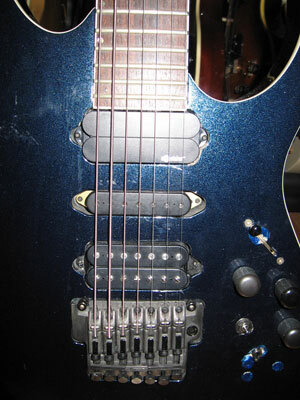 I used Ibanez RG7421XL, longer scale 7 string so that the low strings are bitmore stable. So now I can play some bas s lines or whenever I play chords the lowest notes are at bass range. So this is how I came up with this set up. So between Gary and I we create this huge sounds with just the two of us. I also used this guitar to record some tracks on Brokensoul CD, and surprisingly it came out quite well but for those kind of music I will just use my new RG2228 8 string. I thought of switching to 8 string for Gary gigs but I already got used to using these 7 string so I’m gonna stick this for a bit longer. 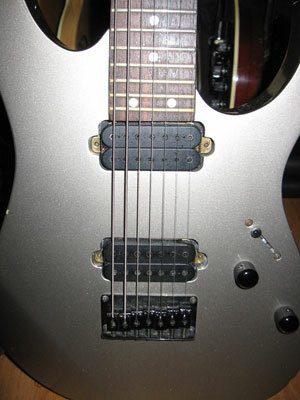 New addition to the super low-7 is this RG2077XL but this one got Fernandes sustainer on it. I took it out of Fernandes Revolver 7 and tosse it in the RG, THis RG was moded originally with preamp so had enough space to install this sustainer. Because of the work previous owner did there are number of holes and stuff but that's ok it's just cosmetics. Also got Dimarzio ToneZone 7 on the bridge with coil tap option. 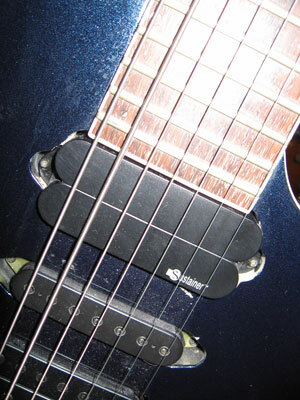 Because I can lock down the string with this one this got better intonation than the original super low-7.